Does your company need a new telephone system but you’re confused about the new telecommunications technology? Do you need help deciding which system is right for your business? Our webinars will help address these questions and more. Whether you are looking at an on-site IP phone system with SIP Trunking or a cloud-based phone system, our educational videos will help you decide which system is right for you. 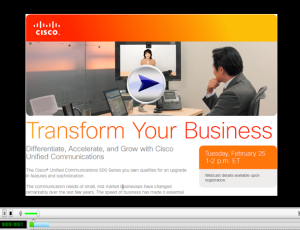 Please view our Cisco, Toshiba and ACC Telecom webinars below. For additional assistance, please contact Customer Service at solutions@acctelecom.com or call at 888-226-2216. Our customer service staff is available Monday through Friday, 8:30a.m. to 5:00pm EST. The Cisco Business Edition 6000 Phone System is a powerful communications system that addresses the “need for speed” when it comes to reliable, efficient communication interactions between internal and external customers. Video, web conferencing, and instant messaging have become preferred methods of communicating and is impacting how business gets done. The Cisco Business Edition 6000 addresses these fast-emerging trends and helps you differentiate the way companies do business, all at a price point designed for the small and medium-sized business customer. STILL CONFUSED ABOUT HOSTED, VOIP, & SIP TECHNOLOGY? This webinar introduces you to ACC Telecom’s cloud-based business voice solutions. Viewers will learn more about Cloud Business Phone Systems (also referred to as Virtual or Hosted Phone Systems) and the difference between SIP Trunks and VoIP Service. We love Hosted / VoIP technology, but…Hosted / VoIP “Cloud-based” Phone Systems are NOT for everyone. We want to set the record straight and clear up misconceptions about Hosted / VoIP Solutions vs On-site PBX pricing and features. Learn which solution is right for your business with our Hosted / VoIP vs. Onsite PBX checklist & network quality tools. Viewers will learn more about ACC Telecom’s affordable Surveillance Solutions customized for any type of business environment. Monitor and control (pan, tilt, zoom) your cameras anywhere at any time from your smartphone, PC or tablet. Enable 24/7 motion-activity alerts with camera activity screen-pops so you’ll always be notified of a possible unauthorized occurrence. Viewers will learn the advantages of Toshiba’s Hybrid/IP premise-based Business Phone System (IPedge) and their Virtual Business Phone System (VIPedge). Viewers will get an inside look at Toshiba’s online user portal where company administrators can make changes directly to their Toshiba phone system without having to contact their PBX provider. Contact us today to learn more about phone systems for small business entities.